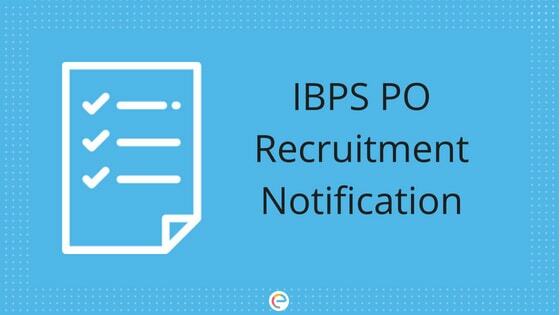 IBPS PO Notification 2018-19: The Institute of Banking Personnel Selection (IBPS) has released the official IBPS PO Notification 2018-19 on the IBPS official website – ibps.in. This year, the conducting authority of IBPS PO exam has announced the recruitment of 4102 Probationary Officers (indicative) in 20 public sector banks in India. According to the IBPS PO Notification, the IBPS PO application form was made available on 14th August 2018 and eligible candidates applied for the exam in the online mode. The Preliminary exam was conducted on 13th, 14th, 20th and 21st October 2018. It is a great chance for aspirants to get into the banking sector of India which is one of the best white collar jobs in the country. Aspiring candidates must have a clear knowledge of all the important things regarding IBPS PO Notification. In this article, we will provide you with all the necessary information. Read on to find out. Let us first look into the important dates for IBPS PO recruitment 2018-19. This will help you plan accordingly. It is very important to be aware of the IBPS PO eligibility criteria before you apply for the exam. (v) (v) a person of Indian origin who has migrated from Pakistan, Burma, Sri Lanka, East African countries of Kenya, Uganda, the United Republic of Tanzania (formerly Tanganyika and Zanzibar), Zambia, Malawi, Zaire, Ethiopia and Vietnam with the intention of permanently settling in India, provided that a candidate belonging to categories (ii), (iii), (iv) & (v) above shall be a person in whose favour a certificate of eligibility has been issued by the Government of India. Age Limit The minimum age requirement for IBPS PO is 20 years while the maximum age is 30 years. This means candidates must be born on or after 2nd August 1988 and not later than 1st August 1998. Candidates who are eligible for the exam will be able to apply for the exam only in the online mode on the IBPS official website – ibps.in. As mentioned above, the online registration will begin on the 14th of August 2018. Step 1 Go to the official website of IBPS – ibps.in. Step 2 Click on the link provided for “CRP PO/MT”. Step 3 Click on “Click Here to Apply Online”. Step 5 Enter your basic information, like Name, Date of Birth, Email ID and Mobile Number to register yourself. Step 6 A Provisional Registration Number and Password will be generated. Note them down. The same will also be sent to you via your registered phone number and email ID. Step 7 Login with your Provisional Registration Number and Password, and edit the particulars if necessary. Step 8 Enter your Personal, Academic and other details. Step 9 Upload scanned copies of your Photograph, Signature, Left Thumb Impression and a hand-written declaration. Step 10 Make payment of IBPS PO application form fees. Step 11 Submit your application. Step 12 Take a printout of your IBPS PO Online application form for future reference. The IBPS PO application fee can be paid only in the online mode. That is, candidates can pay the application fees using Credit Cards, Debit Cards (RuPay/Visa/Maestro/MasterCard), Internet Banking, Mobile Wallet/Cash Cards, IMPS. As mentioned above, IBPS PO exam is conducted in three stages: Prelims, Mains and Personal Interview. The IBPS PO Prelims and Mains exam are conducted in the online mode. The Preliminary exam is only to shortlist candidates for the Main exam. Final selection for provisional allotment will be made based on the candidates’ marks in Main and Personal Interview. The total time duration for IBPS PO Preliminary exam is 1 hour wherein each of the sections is separately timed. The Main exam too is separately timed. It is to be noted that there is negative marking for wrong answers in both Prelims and Mains. For incorrect answers, 0.25 percent of the marks assigned to a question will be deducted. As mentioned above, candidates will be finally selected based on their performance in the Main exam and Personal Interview (80:20 ratio). Personal Interview will be conducted for 100 marks. The qualifying marks for Personal Interview is 35 percent for SC/ST/PwD candidates and 40 percent for others. Candidates must score as high as possible in both Main and Personal Interview in order to ensure provisional allotment. Both Prelims and Mains exam has two different kinds of IBPS PO cut off – Overall cutoff and Sectional cutoff. Candidates must clear both the cutoffs in each stage in order to appear for the next stage. You must remember that clearing the cutoff is enough for the Preliminary exam as it is just qualifying in nature. However, in the Main exam, you must score as high as possible. Both overall and sectional cutoffs will be decided by the IBPS based on the number of vacancies, number of candidates appearing for the exam, and the difficulty level of the exam. IBPS PO admit card/ call letter / hall ticket will be released separately for each stage of the exam. Candidates will have to login with their Registration Number and Password/Date of Birth in order to download the IBPS PO admit card. Now that you know everything about IBPS PO Recruitment Notification, start your IBPS PO preparation. Get a clear knowledge of the IBPS PO exam pattern and IBPS PO syllabus and plan accordingly. Finish each and every topic in the most effective way and solve as many IBPS PO practice questions as possible. Make sure you take IBPS PO mock tests once you have finished the whole syllabus. Work on your mistakes an weaknesses as well. Develop a proper balance between your speed and accuracy. At Embibe, we provide bank PO mock tests which you can avail for free. Take these mock tests and take your preparation to the next level so that you crack this exam with flying colors. We hope this detailed article on IBPS PO Notification helps you. If you have any query regarding IBPS PO Notification, feel free to contact us We will definitely help you out.